As a first step to protect the interests of local Malaysians, the state government is proposing to increase the minimum limit for foreign purchases of all properties from the existing level of RM 500,000 to RM1 million with a higher limit of RM 2 million for landed properties only in Penang island and retaining the present RM 500,000 limit for Permanent Residents. In 2010 and 2011 there were 774 and 890 property transactions involving foreigners. These transactions constitute only 2.98% and 2.26% respectively of the total number of transations in Penang. However to protect the interests of locals to ensure that they enjoy priority for less expensive properties, this restriction will help to provide a level playing field since foreigners have the advantage of a higher currency. The Penang state government stresses that we welcome foreign participation in our economy including our property market. The state government feels that foreign participation can be profitable to both Penangites and foreigners in the higher end market where they can add value by helping Penang to transform itself into an international and intelligent city. We would like to get feedback and opinions from NGOs, property developers, foreigners and the public on this proposal. The state government hopes to implement this proposal the earliest by 1 June 2012 or the latest by 1 July 2012. It would be good to know what percentage of the sales from RM 500,000 to RM 1,000,000 for condos, and RM 2,000,000 for landed properties were purchases by foreigners. But it seems like an overly drastic measure given a 2.5% rate of foreign purchasers. To slow the rise in prices I believe increasing the downpayment requirements (including the extremely minimal downpayment requirements on housing in the process of being built. To be effective this should be done on all purchases (not just foreigners). Without more focused data on the foreign purchases in the ranges being targeted however it is hard to determine what the impact of any measure could possibly be. Participants in MM2H (as well as permanent residents) are permitted to buy/own 2 properties at the RM 500,000 minimum level; which could definitely increase the applications for that program. That could be one of the reasons this action was taken. As noted earlier, in trying to cope with the noise pollution at my condo, I ordered some devices to help mask the most annoying noises. One of the devices I ordered was sleep mate (which generates “white noise” mechanically). But in my sleep deprived state (from not being able to sleep with all the noise) I didn’t notice that it required 115 volts (this is used in the USA, but Malaysia uses 240 volts). 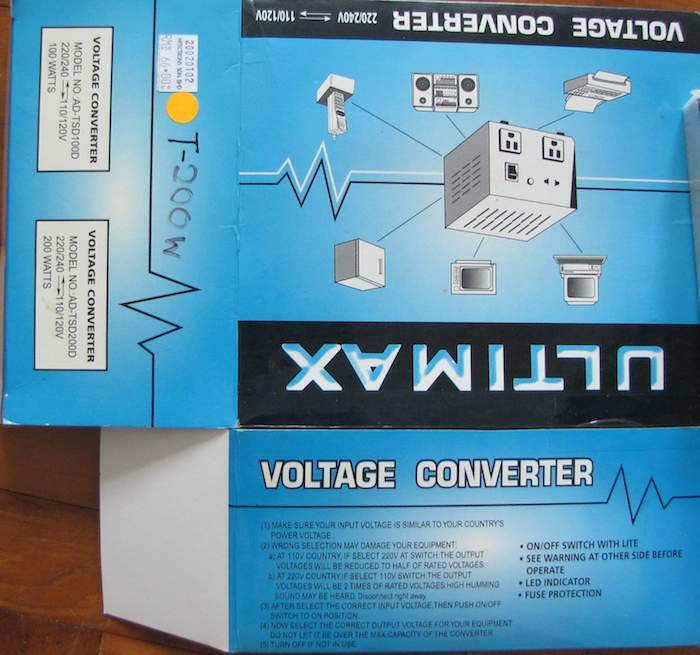 Ultimax voltage transformer 240 volts to 115 voltes. In order to use a device that can only take 115 volts you need a transformer to convert the volts down from 240 to 115. 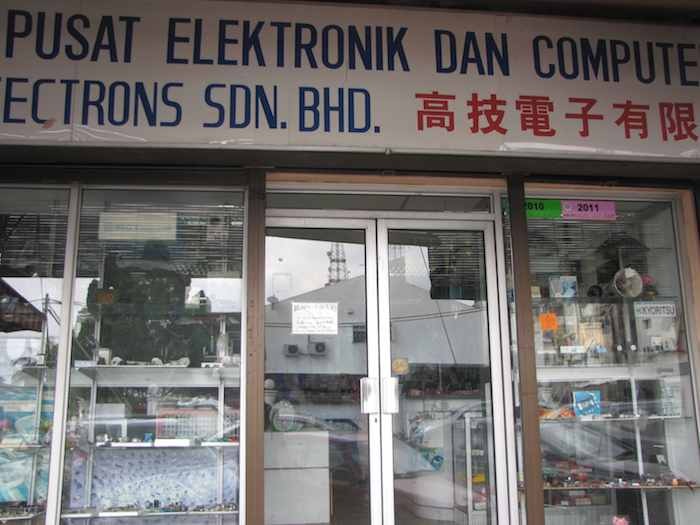 Finding such a transformer in Johor Bahru was not easy, but I finally did at a little electronics shop. If you are looking for a voltage converter give them a call. I would try and get this same model – it was far cheaper than other options. And the other options required some additional wiring (the shop is more for electricians than just people wanting a transformer to plug in and use). The staff was very helpful. Malaysia doesn’t have noise pollution standards as far as I can tell (does anyone know if this is accurate – if they do exist they sure are not enforced effectively). So you may well find extremely loud noises from extremely loud speakers from street events, bars and temples late into the night and very early in the morning. At some Johor Bahru condos this is not a huge issue, but at others it is a huge problem. There are various methods of trying to cope with noise pollution. Installing windows that are at least double-paned can help (but if the speakers are blasting away too loudly that will only reduce the problem, but not effectively deal with it). Heavy curtains can also noticeably reduce noise pollution penetrating into the room (but they are not nearly as effective as good windows). I am still looking for some way to buy such curtains in Johor Bahru (or get them shipped here). Please comment if you know where I can get them, or someone who is willing to make them for me (it really shouldn’t be that hard). I have talked to numerous places without any success. And I have emailed some places and don’t even get a response. Upon discovering how bad the noise pollution was (I don’t know the scope of the problem yet, some days it is extremely bad far later into the night and starting again very early the next morning – other days is just very bad but only for a few hours). I bought some headphones and a fan locally and ordered some devices to mask noise pollution (they generate more noise in the hopes of canceling out more annoying noise) from Amazon. I was amazed to get the devices shipped from the USA to Malaysia in just 4 days. The Ecotones Sound + Sleep Machine is a great device that creates various noises (stream, ocean, fireplace, rainfall, meadow…). One great feature of this device is that it has a microphone it uses to hear the noise level and then adjusts to increase the volume it produces to mask the noise pollution. It also will accept 100-240 volts (it has a transformer itself – like computer laptops do). It is very good for low levels of noise pollution (I would say under 60 decibels). However high levels it has to get so loud to mask them that it isn’t very useful. Fans also work decently for low levels of noise. The combination of the sleep machine, a fan, and earplugs, in my bedroom, is enough on most nights. However, on nights (and days) with louder noise pollution – I would estimate over 80 decibels getting into my room (as loud as if someone placed a TV in your room and turned it on – it is definitely significantly louder than my TV) those don’t work – even with all that, the noise pollution still gets through. The noise pollution is by far the most annoying thing I have had to deal with here. I am surprised (and extremely disappointed) that I was recommended this condo given how important I said peace and quite was. But my experience is an example of how important it is to beware, as the purchaser, and watch out for yourself. I am not sure how bad noise pollution is at all other condos but many have to be far superior in that regard to mine. Other than that problem (which is huge) this condo has many advantages. Realtors in Johor Bahru are in the business of renting the units they have. You can’t count on them actually knowing the strengths and weaknesses of options and presenting you their expert advice on what meets your needs (some will, others won’t). I would say this is the only big problem I have had. Otherwise many things have gone well. As I write this, for at least 44 of the last 60 hours I have had extremely loud speakers blasted into my bedroom (over over 75 decibels and over 85 for many hours), it is unbelievable to me that this is tolerated as acceptable behavior. But it is. On my balcony it is often over 100 decibels, I would estimate, though not for quite as long – maybe 20 of the last 60 hours (the level increases from very loud to extremely loud at various times). Over the years I have thought about taking up swimming to get some healthy exercise but I never do. When I start swimming I am so lame I can barely make it a few laps. And I had to go to a pool, get changed, swim (for a few minutes before I was too tired), get changed, go home… So I never did keep it up. Now I have a pool an elevator ride away. I have been swimming several times a week for a few weeks now. I still can’t get very far. Which is good in that I get an aerobic workout really quick, because I am such an inefficient swimmer. But also bad in that I get don’t a very long aerobic workout without risking swallowing large amounts of water. Today I made 10 lengths (5 laps, if a lap is back and forth) for the first time (maybe the pool is 20 yards long but maybe a bit shorter – about 15 meters, maybe a bit longer?). It does seem like this will be a way for me to get some exercise though, so that is good. And hopefully I can add on the laps over the weeks. Hopefully I can find a place to play basketball, historically my main exercise. I will also look to see about tennis or badminton. I am still looking for the best places in Johor Bahru to participate though. Let me know, in the comments, if you have suggestions. As I let the sun dry me after the swim a swallow (or some similar bird) buzzed the pool very close to the water. Which was cool, but I figured the bird was out of luck. I guessed it was looking for insects to eat and the chemically cleaned water didn’t support insects. But it dipped in and caused a small ripple and I figured maybe it caught something or more likely thought it would and tried. But over the next 2 minutes it dove into the water a bit more and at least 10 more time. I would zoom along, fold in its wings and then plop into the water causing quite noticeable ripples. It could just basically bounce off and be flying again. It either had to be playing or cleaning itself I think. It was fun to watch. In Johor Bahru, most of the condos that expats chose have pools. Some are larger (Straits View seemed the largest to me) and some are pretty small (usually at the condos without too many units). Update: P1 is unreliable, do not consider them for anything but a backup. Once they provide historical and real time uptime and real speed data from a 3rd party then you can think of considering them. In 6 weeks they have been down multiple days for multiple hours. One day for 1 hour would be bad. Being down several hours in a month would be very bad. They have been that unreliable and down multiple weeks (I think 50% of the weeks) for multiple hours a multiple days. Extremely poor. They don’t even have bother to apologize and explain each failure (at least 3 long term very serious failures in 6 weeks). As I stated in the last update, that tells you enough them to avoid P1, if you are smart. And it also explains why they keep failing over and over and over (when they don’t even acknowledge the causes of the failures, maybe they don’t even figure them out). Finding a decent provider isn’t easy, the reviews online make it seem like P1 is as good as any provider (maybe Unify is best but it is offered on in very limited locations). I needed broadband internet for my condo in Johor Bahru. In looking at the various options they seemed pretty similar. P1 offers the highest speed I saw 5Mbps and 30Gb a month (for the RM 139 a month plan) and so that seemed best to me. They also offer a 7 day trial period which was nice. And you can use it in 2 hours (after some setup by their system to activate your modem), which is nice. You can check out if your area is covered. My speed was pretty bad at first. I was able to get support through Twitter. After awhile they said they would monitor the modem from their side. Then they said they made tweaks to the modem and things actually do seem better. I really wonder what they do to speed it up? The speed is still not near 5 Mbps. If I average 1.5 Mbps I would be surprised. I have only had it for about a week now so I do need to get more data. Today it has been above 2 Mbps for much of the day so if that continues it could be good (I even had 2 tests where it was nearly 4 Mbps – the average today may well be above 3). But it does seem 5 Mbps is much more a marketing gimick that what you can expect. But I don’t know if p1’s difference from their marketing is any more exaggerated than anyone else. Also I probably need close to 30 Gb so that factor matters to. If I could average 3 Mbps and had very little downtown (99.5% uptime) I will happy. I have had several 10 or 15 min times already where I was trying to get online and couldn’t. I am hoping that is maybe initial setup issues (though really that doesn’t make much sense which is why I am just hoping). p1 has been good enough that I am passing the 7 day mark without cancelling, hopefully I won’t regret it. I think I would have gone with Unify. They are a land-line provider which should be more reliable (historically the problem with landlines has been slow customer service and high fees, Unify is meant to address these issues and seems to be doing better on those scores). Unify’s VIP 5 plan offers 5 Mbps download and 60 Gb per month. Really I think if I was smart this is what I should have done. It takes awhile to setup and I think the upfront charges are more. I might even get Unify on top of p1 (just because I am so reliant on the internet to do my job). I really can’t have outages or it can be a serious problem. Probably it would have been smart to get the Unify package and then the a cheaper p1 plan. Oh well, trying to do all the things I have to do to get setup has been pretty stressful, making a few mistakes isn’t so horrible. I’ll just have to earn more money so I can afford to add Unify (or maybe I’ll find just P1 is enough).